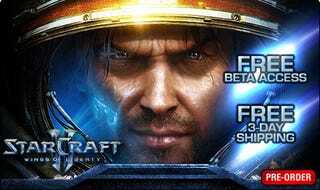 Several readers have pointed us towards the listing for StarCraft II on GameStop's website, where preorders now snag you an invite to the eagerly anticipated strategy game's beta test, as long as you agree not to cancel your order afterwards. There are actually three ways to obtain a StarCraft II beta code through GameStop. You can preorder StarCraft II: Wings of Liberty online and receive your code through email; preorder the game for in-store pick-up, wait 24 hours, and then go to the store for your code; or preorder the game at the store itself, with the code printed out on your receipt. Your best bet is to head over to your local store and drop five dollars on the game. You'll get the beta code, and should you not find the game to your liking, my local GameStop manager says that retail stores will still allow you to cancel your order after the fact.